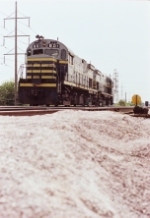 Description: BRC Alcos pull westbound through Pullman Junction. Date of photo approximate. Description: C&O and BRC transfers meet at Mc Cook, I shot this from a tree that used to be by the diamonds! Description: BRC C424 601 at Clearing Yard in Bedford Park, Chicago, Illinois on October 15, 1986, Kodachrome by Chuck Zeiler. 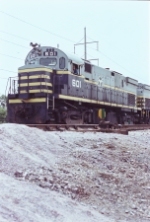 Description: One of BRC's famous Alco Centuries idle along with a gaggle of switchers and diesels. This picture was taken from the top of the hump. Description: Ready to shove'em back! Description: BRC alcos work the rail to water transfer on a very foggy day.